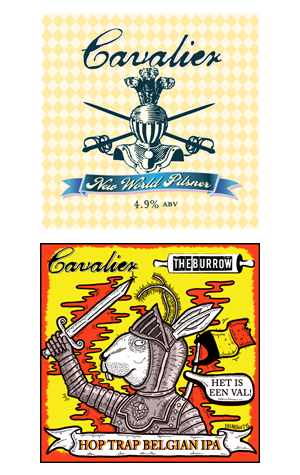 Proving that they do indeed still have time to brew their own beers while still accommodating what sometimes seems like half of the Victorian beer industry at their Sunshine home, Cavalier is back with not one but two new beers. The first, a New World Pilsner, was offered up as a teaser at the recent Good Beer Week Gala Showcase and is one that has been given plenty of time in which to develop. The pale straw coloured beer featuring Kiwi Motueka and Wai-iti hops spent eight weeks in tank before being packaged with the Cavalier crew happy to declare the result is a "beautiful elegant flavour", one of "subtle citrus notes [and] a soft malt backbone". The second new release is their latest joint venture, this time a beer created for Brewsvegas with arch-collaborating West End venue The Burrow. The Hop Trap debuts at The Burrow before going on wider release and we're told it is "red and amber ... with a spicy, malty, citrus fruit flavour and aroma, finishing with a big citrus hit from the Amarillo and Chinook hops."